On June 28, members of the insurance community, alongside large and small technology startups came together for the first Annual InsuranceX Series, hosted by Draper Nexus. cred worked onsite to assist Draper Nexus in this invite-only event, with the goal of connecting members of the insurance community to current game changers within today’s tech scene. An early-stage venture capitalist firm, Draper Nexus focuses on enterprise tech and hardware both in Japan and the US. Tim Draper (Founder of DFJ and Draper Associates) kicked off the conversation around autonomy, in particular how/when autonomous cars will likely shake up the industry for automotive startups and current insurance leaders. 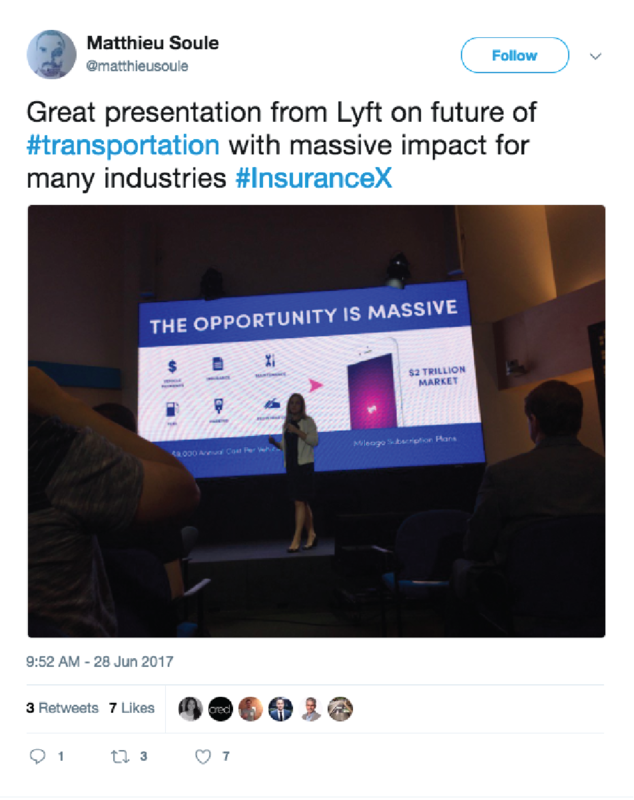 The event also heard insights from Kate Sampson (VP, Risk Solutions, at Lyft) who presented Lyft’s view on the Future of Personal Transportation and even presented Swoop (an emerging startup looking to automate roadside assistance) with a $50,000 check during a Startup Pitch competition. Representatives from State Farm, Farmer’s Insurance, Atlas Financial, Toyota, BMW i Ventures, and Renault touched on the future of personal transit, InsurTech landscape, connected cars as data platforms, and how startups can best work with insurance providers. In total, over 100 people participated and took away one key element from the day: while making headlines today, the most capable, and consumer-friendly, autonomous car is still quite a few years away.